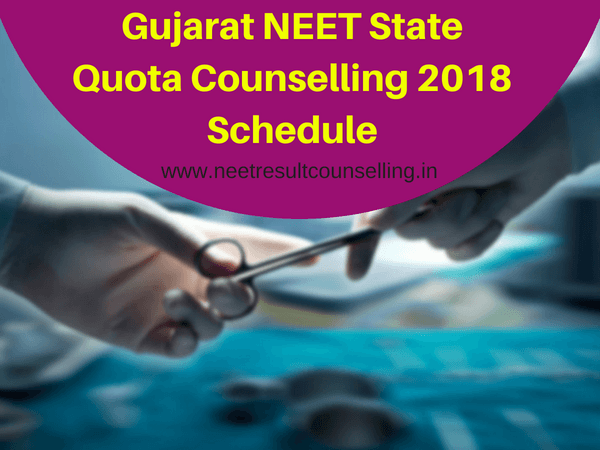 Gujarat NEET State Quota Counselling 2018: Gujarat NEET State Quota counseling has been started. Online counseling is conducting for admission of eligible NEET candidates into MBBS and BDS courses in various medical and dental colleges of the state. Counseling is strictly based on the merit of the candidates, therefore, only those candidates will be eligible for participating in counseling whose names will be there in the merit list. 85% state quota seats in Gujarat will be filled by the state counseling authority i.e. Admission Committee for Professional Undergraduate Medical Educational Courses (ACPUGMEC) whereas counseling for remaining 15% All India Quota seats will be conducted by Medical Counseling Committee (MCC), India. In this article, we have shared all the important information about the schedule, registration, eligibility criteria, and procedure of the Gujarat 2018 State Quota counseling. Counseling dates given here are the final dates. Registration is important for candidates if they want to participate in the state counseling. Registration will be done only through the online mode. Eligible candidates have to get the information booklet with PIN from the designated branch of Axis bank determined by the admission committee in Gujarat. To get the PIN from the bank candidates have to pay an amount of Rs.200 in cash. After getting PIN candidate have to register for counseling and have to fill choice of courses and college as per their preference. It is mandatory to take a printout of the registration form after online submission. Candidates must be a citizen of India. Non-Resident Indian and their wards are also eligible. For MBBS- Candidates must have qualified 10+2 with Physics, Chemistry, Biology / Biotechnology with English as compulsory subjects from a recognized board. Candidate must have obtained minimum 50% (40% for SC/ST/SEBC & 45% for PH) together in all the subjects. Note- No reservation is applicable for migrated candidates from other states. Candidates have to purchase information booklet with PIN from the recognized Axis banks in Gujarat. Without PIN no candidate will be able to fill the registration form. 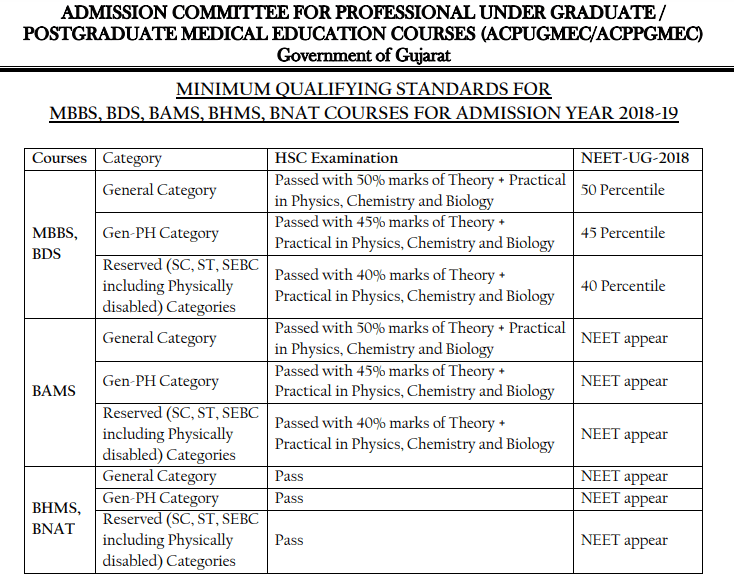 Now, with the help of PIN candidates can register themselves for Gujarat NEET 2018 state quota counseling by providing all the necessary details. If any candidate wants to correct or make changes in the data, he/she can do so by visiting the nearby Help center. After successful registration candidates have to fill choices for preferred course and college. Candidates have to carry their original documents with the attested copies to the help centre for verification. On the basis of NEET All India Overall rank and documents, merit list of candidates will be published. Allotment of seats- On the basis of choices filled by the candidates, NEET rank and availability of seats, counseling authority will allot seats to the candidates and will publish the result online. Reporting- Candidates now have to report to the allotted colleges and have to confirm their admission by payment of the tuition fee. *Candidates have to produce original and a self-attested copy of all the aforementioned documents along with the printed copy of filled-in registration form. Gujarat NEET State Quota Counselling 2018 will be conducted in the month of June 2018 through online mode by the notified counseling authority. In case candidates want to make changes and correction in the filled data they can visit the nearby help centre or central control room with the relevant documents.